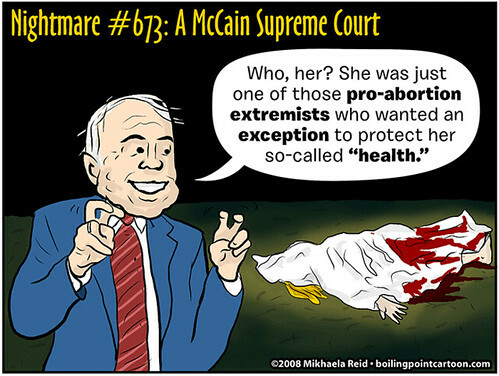 Boiling Point Blog: Feminist, LGBT and progressive political cartoons: Toon: McCain on Women's Quote "Health"
We do not want to see a McCain Supreme Court, that's for sure. See my previous post for more details. Nice. He looks so funny with those bunny-fingers. I'm pro-life (in most cases), but I have to say "congratulations" on a very striking and effective cartoon. It's kind of cool how a simple drawing can get so much meaning across.